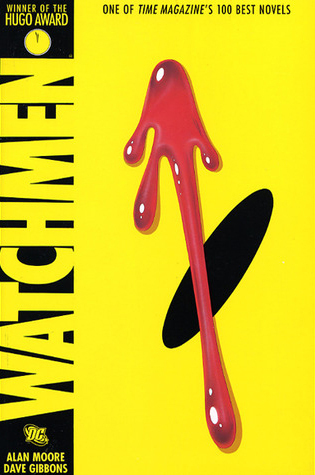 For the #GetGraphicReadathon I read Watchmen by Alan Moore. I enjoyed it although it was very though material to get through due to the depressing nature of the story. In an alternate world where the mere presence of American superheroes changed history, the US won the Vietnam War, Nixon is still president, and the cold war is in full effect. WATCHMEN begins as a murder-mystery, but soon unfolds into a planet-altering conspiracy. As the resolution comes to a head, the unlikely group of reunited heroes–Rorschach, Nite Owl, Silk Spectre, Dr. Manhattan and Ozymandias–have to test the limits of their convictions and ask themselves where the true line is between good and evil. I give Watchmen by Alan Moore three out of five hearts because I didn’t fall in love with it and had a hard time getting through it. The comic was well drawn and the style suited the depressing mood of the story. The story itself was very much character driven, which I liked. Rorschach is a great character, because only until his mask is taken off when he is arrested, you don’t know you have seen him already several times walking around without mask. And it is interesting to see how he really sees his mask as his face and not his own as his face. Dr. Manhattan has an interesting background and I wished there was more in the comic on what goes on in his head, because it made me curious. The same goes a bit for Silk Spectre. I would have liked also some more info on Ozymandias, because of the end. It is not that the end comes as a surprise, but I think it could have been a bit better build up. I was sort of blown away by the end, it felt rediculous and very stupid. An alien appears into new york and it is suggested that they appeared all over the world, to united the world against the aliens. It felt really stupid and weird. But the rest of the story was fine. As a final to finishing the comic I watched the movie Watchmen, directed by Zack Snyder and staring Patrick Wilson, Carla Gugino, Malin Akerman and Jeffrey Dean Morgan. It was an enjoyable movie, but I liked it less than the comic. Some things are completely missing from the story, like for example the pirate comic in the comic and some things were changed, which were not always bad. But there are scenes in the end where you as a watcher, if you have not read the comic, can’t make sense of because there was no mention of anything before. Which I thought was bad. I know there is a ultimate cut of four hours or so, in which it is probably explained. But I didn’t watch that one because it is way too long. I did like then ending better because it didn’t seem so random. Here they used an energy signature of Dr. Manhattan to attack earth instead of the alien in the comic, which was much more logical. The movie had some positive changes but also negative. I would give it the same rating as the comic book. Let me know what you thought of this book and/or movie! This entry was posted in Book Review and tagged Adventure, Alan Moore, Book Review, Comic, Dystopia, Movie, Romance. Bookmark the permalink.